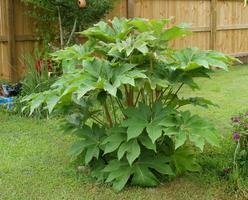 Large leafed plants can look unique, tropical and add a striking flair to any garden. If you have the space for big leaves, you will add another dimension to your garden that is sure to get people talking. 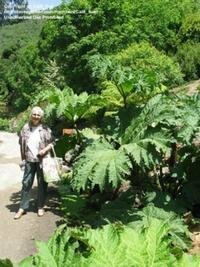 Here is a general overview of some big-leafed plants to try such as Sweet Coltsfoot, Rhubarb, Poor Man's Parasol, and several other plants that will, without a doubt, make your mouth water. Sweet Coltsfoot, sometimes called Butterbur, is a very desirable large leafed plant that originated in Japan and is also found in the wild in Korea and China. It is hardy to Zone 5 (reports of Zone 3 hardiness exist) and in the spring, crowned-cluster flowers emerge before the impressive foliage. Sweet Coltsfoot does best when grown in partial to full shade with consistently moist soil. It will wilt in full sun unless excessively watered. It is an excellent shoreline plant for large ponds or bogs and can spread voraciously in the correct conditions. To control rhizome invasiveness, it can be put into the ground in a large pot. In Japan, the leaf stalks are commonly cooked as a vegetable called Fuki. Traditional preparation involves salting and soaking in warm water prior to cooking to eradicate its potent odor. Before you start a Fuki farm, you should know that the plant is also associated with cumulative liver damage. 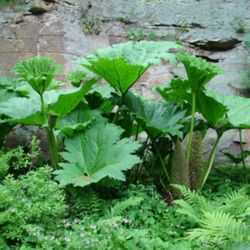 Giant Rhubarb, also known as Dinosaur Food, is native to the Sierra del Mar Mountains in Brazil. Its leaves commonly reach 6 feet wide and 11 feet long. Both the underside of the leaves and the stalks have thorns and the tops of the leaves have the texture of sandpaper. Giant Rhubarb is happiest in a bog setting much like its cloudy, mountainous tropical home. Its conical, large (2 to 3 feet tall) flowers which start green, turn red and eventually brown as they mature, appear from July to August. 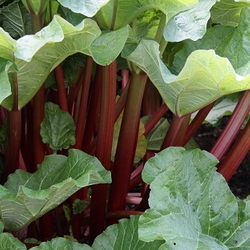 The best time to divide Giant Rhubarb is from March to May before the plant gets too large by cutting off a corm or large root and planting in shady, bog conditions. 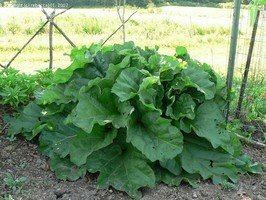 Regular old, vegetable grade Rhubarb, sometimes called "pie plant," also has impressively large leaves. 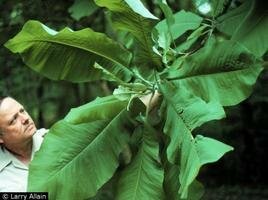 This plant is extremely cold hardy (Zone 3) and can suffice in climates that would not work for some of these other tropical large leafed plants. Surprisingly, the leaves of rhubarb are poisonous, but the tart-tasting, purplish-red stalks are commonly harvested to make pies, jams and sauces. Its history can be traced back to 2700 B.C. in China, where it was used for medicinal purposes. It was spread to Europe for pharmaceutical uses and in the late 18th century, was brought to the United States by an unnamed gardener. The Bigleaf Magnolia is a rare native U.S. tree that can be found in the South-Central and Gulf Coast regions. Its leaves can be 30 inches long, which is larger than any other U.S. native tree, and its flowers can reach over a foot, which is larger than any other native U.S. species. The tree needs moist, shaded areas which are protected from wind, which can easily shred the large leaves. 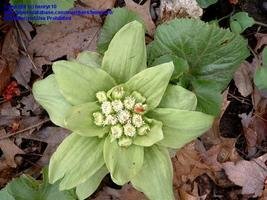 Although it is native to the southern states, it can be grown with the right conditions around the country and seems to be readily available with online retailers. 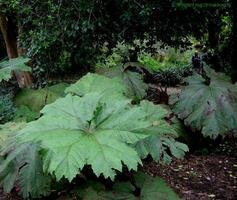 Poor Man's Parasol, also called Poor Man's Umbrella, is a close relative of Giant Rhubarb which is also in the Gunnera genus. 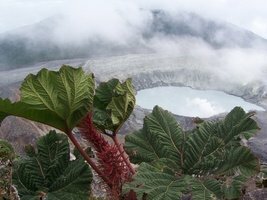 It is native to Central and South America, growing in mountainous tropical and subtropical environments with cloudy, low light. To grow Poor Man's Parasol at home, place it in shade or filtered sun with regular water. The leaves of Poor Man's Parasol can reach up to 4 to 6 feet across, which gives them their very descriptive name. The seeds are poisonous and all parts of the plant can cause adverse skin reactions. The Umbrella Plant is a native of California and Oregon and, like most large leafed plants, likes moist conditions. The plant's leaves can grow over a foot across and the plant can get to 3 to 4 feet tall. The Umbrella Plant thrives is cold moving water, much like the streams in Northern California where it originated. In order to survive in warmer climates, such as southern U.S. Zones 8 to 10, it needs full shade and lots of water. The Rice-Paper Tree is a perennial shrub native to Taiwan. The leaves can reach up to 3 feet and the plant can grow up to 20 feet in the right conditions. 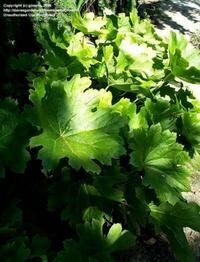 The plant can handle full sun with enough water but can also grow well in full shade. The plant can spread new shoots extensively through its root system. 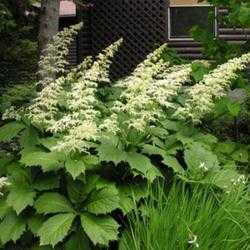 In fall, the Rice-Paper Plant blooms airy looking, white umbels on long arching stems. Historians believe that as far back as 105 A.D., the plant was used for making rice paper during the Han Dynasty . The same process is possible today by softening the pith in water and rolling it out into paper. Some other big-leafed plants to look up are Rodgersia tabularis (syn. Astilboides tabularis), Cardoon (Cynara cardunculus), Paperplant (Fatsia japonica), and Colocasia gigantea Thailand Giant Strain'.